With a heavy heart…I thought I should go to bed early even if I don’t have to go to work tomorrow. If you haven’t heard, the protesters that took the streets in Bangkok initially because of the blanket amnesty bill have now broken into official buildings – my work place, the Ministry of Foreign Affairs, included. If this is a dream, it’s a bad one… and I want to wake up already. Dental Floss: Viriya! Viriya! Don’t forget me!!! Dental Floss: But you need to clean your teeth properly! Dental Floss: But you need me to remove all the food traces and dental plaque from your teeth. Brushing your teeth alone is not enough Viriya. Viriya: But it’s not absolutely necessary. I’m going to skip flossing for tonight. I am not in the mood. Dental Floss: And you think you should leave food traces around small areas of your teeth for the whole night? Dental Floss: I care! That’s what I am for! If you’re not going to use me then why did you buy me? Viriya: I used you yesterday, I may use you tomorrow… but I am not using you tonight. Be quiet… I will make my own decisions. Dental Floss: You are so mean Viriya. Viriya: Mean? Why am I mean? I am giving you a day off. To many people, an unexpected holiday is a good day. Dental Floss: But that means I’m useless for a day. A day is a lot for me Viriya. Viriya: It’s just 24 hours…and why would a dental floss be worried about time? Viriya: then you should be happy with a day of freedom Floss. Dental Floss: But if you don’t use me to clean your teeth, what am I supposed to do? I can do nothing else Viriya. I was made to remove food traces, and I can only remove food traces from your teeth. Viriya: Don’t you have friends? Go meet up with your friends. Dental Floss: I don’t know any friends. The only other being that concerns me is you. I was made to clean teeth and you bought me, therefore you should use me to clean your teeth. Viriya: Why are you so concerned about how clean my teeth is? It’s up to me whether I want to use you or not, and I have decided that I will not use you tonight. Dental Floss:And I’m telling you now that you should! Viriya: You shouldn’t even be speaking to me! You’re dental floss!!!! Dental Floss: In extreme circumstances, don’t you think we all have the right to speak up? Viriya: …yes I do. But is this an extreme circumstance? Dental Floss: To me it is! Viriya: Okay it’s up to you to decide what’s extreme for you…but it’s not natural for dental flosses to speak to humans, and it’s not okay for you to make decisions for me. Viriya: Well…I’ve been a human being living on Earth all this time and this is the first that a dental floss talks to me. Dental Floss: That doesn’t mean that dental flosses do not speak. That can mean that you have finally met a dental floss that talks TO YOU! I had no need to speak to you before, but now I do. So hear me out. Viriya: I have heard you… and I have provided you with answers. What more do you want from me? Dental Floss: You now need to use me! Viriya: … I don’t need you to make decisions for me. Dental Floss: but I know about cleaning teeth much better than you. Dental Floss: Your teeth are still dirty and you need to clean them properly. Viriya: Who are you to say that my teeth are still dirty and only you can clean it? The toothbrush already did a fine job. Viriya: Today, that is enough for me. Even if I use you, would my teeth be perfectly cleaned? Viriya: Why are you so sure that you can clean my teeth better than the toothbrush? Dental Floss: Because I know I can clean small areas better. Viriya: But the toothbrush already cleaned most of the teeth surface. Can you also do that? If you can…I will only use you from now on. Can I just use you alone Floss? Viriya: So you’re not better than the toothbrush? Dental Floss: No, but you need to use me WITH the toothbrush. Viriya: I will use you when I feel like I need extra cleaning. Viriya: And you are not respecting my decisions. I have picked you out of all the dental flosses at the shop and brought you home. I should be able to decide when I want to use you. You work for me, and I gave you a holiday. Just be happy with that! 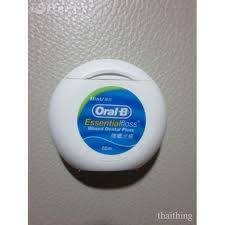 Dental Floss: Why should I be happy when this means you don’t need me? Viriya: I bought you… Does that not show you I want you? Why are you forcing me to use you when I don’t want to? Dental Floss: Because you’re making me feel useless. You need to know that I have a function… and to use me would be better for your dental hygiene. Viriya: Yes…that may be true. But you forcing your service on me do not make me want to use you either. Dental Floss: Then what could I have done? I see your teeth dirty and I want to clean them. You have decided not to use me so I need to talk you back into it. I didn’t force my service to you, I’m trying to convince you. Viriya: So what if I’m still not going to use you? Dental Floss: I will make it so that you can never come into the bathroom again until you let me clean your teeth. Viriya: But this is my bathroom!!!! You’re just an object in my bathroom…you do not have the power to stop me. Dental Floss: If I cannot stop you, I will stop every object in the bathroom from working for you! Viriya: This is ridiculous…you’re not convincing me, you are forcing me!!! Dental Floss: Am I? I’m just a normal dental floss that wants to be used. Viriya: I’m just saying how things usually are. Dental flosses don’t usually speak. Dental Floss: But I have spoken. Did you hear me? Dental Floss: And are you going to use me? increasing your rankings naturally. There is very useful wordpress plugin which can help you.